A good fantasy manager keeps an eye on the injured and suspended players in the Bundesliga. Improve your Bundesliga Fantasy Team. The Bundesliga injured list is an enormously helpful tool for every fantasy manager. Logically, fantasy football always involves the players who are actually on the field. However, an often overlooked aspect of the Fantasy Bundesliga is finding out who is not actually going to play. While many fantasy managers are looking for match winners for their drafts to increase their chances of winning, it can be just as rewarding to exclude some players in advance. The injured list helps you to get an overview of both injuries and suspensions. Therefore, as a service to the community, 11Heroes has put together a list of specialized providers who support fantasy managers and always have the latest list of injuries for the Bundesliga. You can also find our updates and tips for the game day in the Community Forum and the 11_Heroes Twitter Channel. So it’s always worth taking a look at the Bundesliga’s current list of injuries and suspensions to see who a team can not call up for the next game. We recommend the following injury list for the Bundesliga. 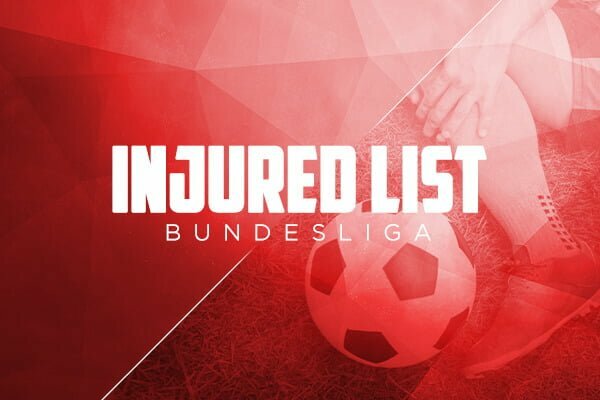 Injured List on Transfermarkt: The number 1 transfer site also has a good and regularly-updated injury list for the Bundesliga. A good fantasy manager keeps an eye on the latest injuries and suspensions. The successful performance of your fantasy teams depends on your ability to eliminate all players who will miss games due to an injury or suspension. Here are a few strategic tips on why an injury list improves your lineups. Your team must not lose points because of players being absent through injuries or suspensions. You don’t have to worry about changing your fantasy teams in a rush when the official line-ups appear. These were our tips on how a fantasy manager can use the Bundesliga injuries list to gain a small advantage in fantasy tournaments. Have fun with the Bundesliga fantasy tournaments! I’m look forward to your feedback in the comments. What are your tips for the Bundesliga and where do you go to learn about current absences?